On this day the Lewis and Clark Expedition to the Pacific Ocean camped on the bank of the Missouri River at the base of a river landmark near here, now called The Tower. Clark wrote, "Capt Lewis & my Self walked up to the top which forms a Cone and is about 70 feet higher than the high lands around it." Nearby they "discovered a Village of an annamale the french Call the Prarie Dog...the Village of those animals Covs. about 4 acrs of Ground on a Gradual decent of a hill and Contains great numbers of holes on the top of which those little animals Sit erect make a Whistleing noise and whin allarmed Slip into their hole." They "attempted to dig to the beds of one of thos animals, after diging 6 feet, found by running a pole down that we were not half way to his Lodges." They finally "Cought one a live by poreing a great quantity of water in his hole." 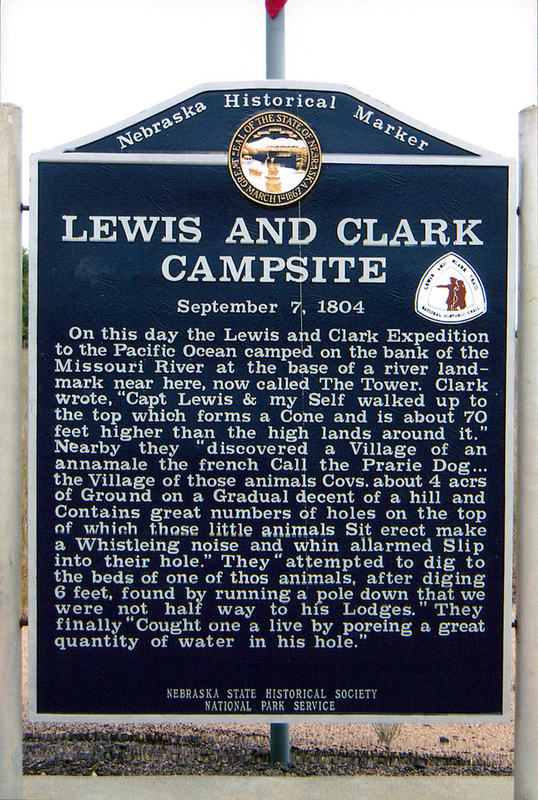 “Lewis and Clark Camp Site: Sept 7, 1804,” Explore Nebraska History, accessed April 19, 2019, https://mynehistory.com/items/show/21.